This was definitely one of my favorite shoots so far because I had the chance to collaborate with so many talented #Girlboss’s! 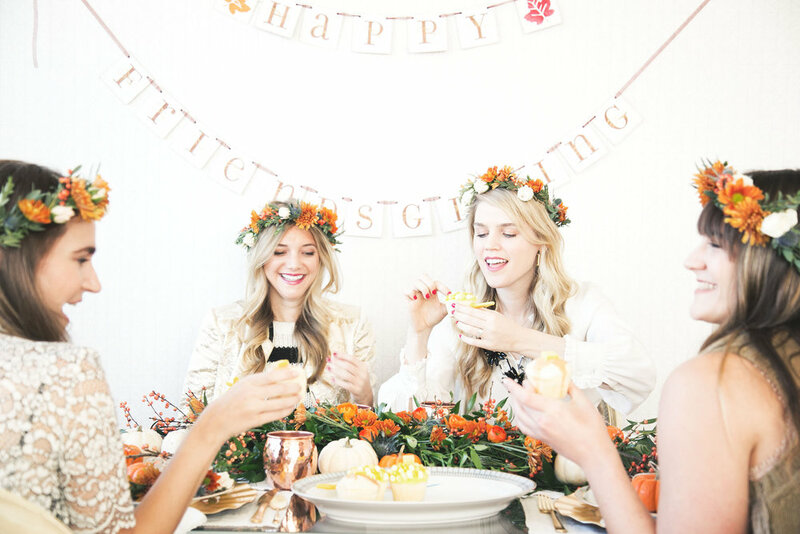 I was so excited to host this friends giving alongside my favorite flower queen, Christy Doramus creator of Crowns By Christy! When having a friendsgiving I think it is so cute to pick a theme, and with ours we decided to do a harvest theme. Christy put together the gorgeous tablescape. She decorated the beautiful Lucite table with flowers, pumpkins, and stunning calligraphy name tags made by Mot Problems. 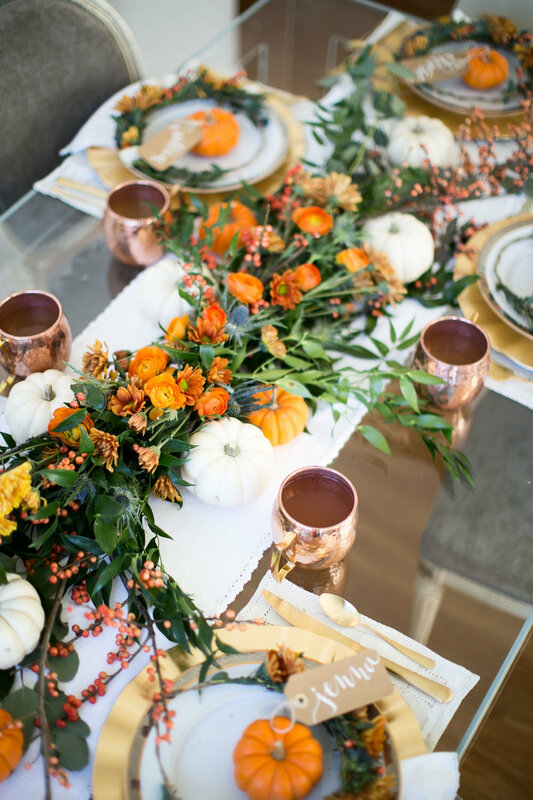 And to top it off, each guest had their own fall themed flower crown. It is always so fun to put out little headpieces for your guest to put on to really get into the friendsgiving spirit. As for the food and drink part of the shoot we had the MOST unbelievable Thanksgiving themed cupcakes by Reality Bites Cupcakes!!! Please check out her website and Instagram. They are honestly the most creative and delicious cupcakes I have ever had! 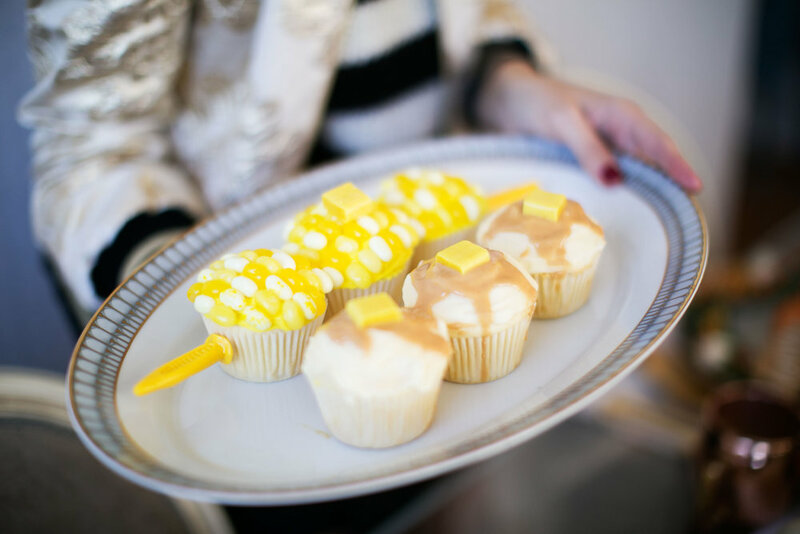 The founder and creator of RBC Ashley Foxen started making cupcakes for friends out of her small NYC apartment. Ashley creates personalized cupcakes for any occasion. They are seriously the best! As for the drinks, we used all different juices from American Juice Company to make ginger cocktails. AJC was founded in 2012 by Christopher Wirth who teamed up with his friend and colleague, Massimiliano Matté, a renowned mixologist and nominee for the prestigious "Perfect Barman de Paris" award known for his collaborations with celebrated chefs like Alain Ducasse and Heinz Beck. They founded American Juice Company with the goal of creating incredibly unique juice blends and making them available to every bar, restaurant, hotel, and home. They are seriously delicious, and healthy too… So you don’t have to feel bad about ordering another cocktail or another lol! It’s always fun (and a great photo op) to have a dressy friendsgiving. 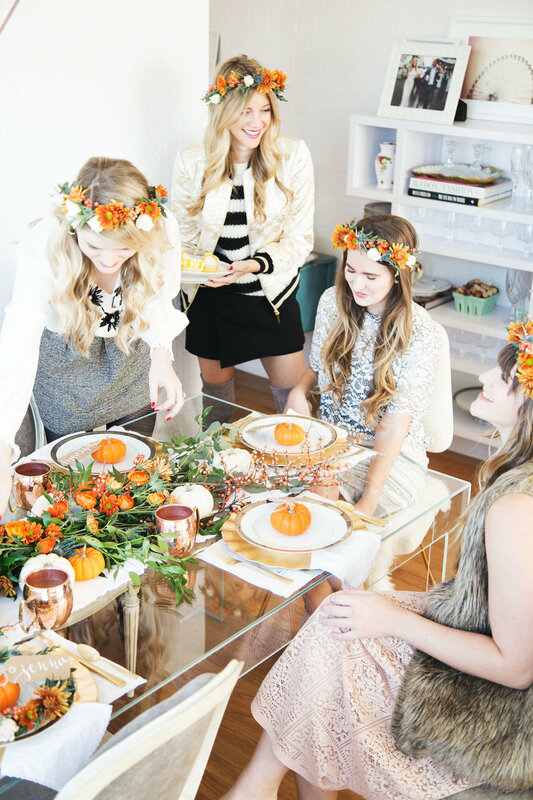 Everyone wants an excuse to dress up and friendsgiving is perfect for that! In this shoot we are all wearing pieces from Trina Turk. Trina Turk came on to the scene in 1995 by Trina and her husband, photographer Jonathan Skow, as a women’s contemporary clothing line, Trina Turk has evolved into an iconic lifestyle brand, celebrating California style with eleven annual collections of chic women’s ready-to-wear and accessories, plus swimwear, recreation/activewear, a Mr Turk menswear line, and residential décor and textiles. I loved this gold bomber jacket I grabbed at the Trina Turk store in Meatpacking. I love a good bomber, and this metallic gold one is perfect for the holiday season! I paired it with a black and white Trina Turk stripped sweater… it was so beyond cozy for a crisp fall day! Please share your friendsgiving ideas! Would love to hear!